You’re in for a special treat this week, #GenXYZ. We’re giving you a double dose of #WebsiteWednesday by highlighting two sites that are reshaping the way we use resources and helping to build a sustainable future: NxtLvlWater.xyz and NxtLvlFarms.xyz. Some of you may have recognized these two sites share a familiar brand to a past #WebsiteWednesday site, NxtLvlAcademy.xyz. That’s because NxtLvlAcademy.xyz, NxtLvlFarms.xyz, and NxtLvlWater.xyz are all projects launched by Bainbridge MP, a tech investment company from the Philippines seeking to support technologies that will bring impactful change to the most basic global problems. Bainbridge uses each specific “NxtLvl” .xyz site to explain the goals of that project, the methods they will use to accomplish those goals, and how you can get involved. 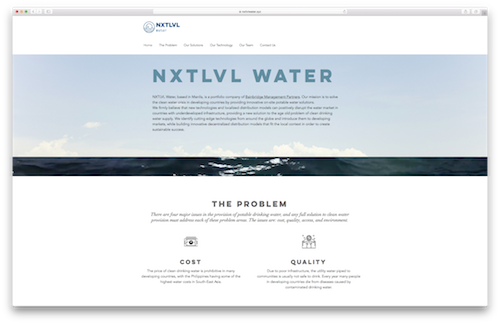 NxtLvlWater.xyz is aimed at tackling the clean water crisis in developing countries, where water is too expensive, too difficult to access, too poor quality to safely drink, and too harmful to the environment. By using small scale solutions like modularized water production units, as well as large scale solutions like bespoke water production systems, all of which are capable of running off of renewable energy up to 100%. 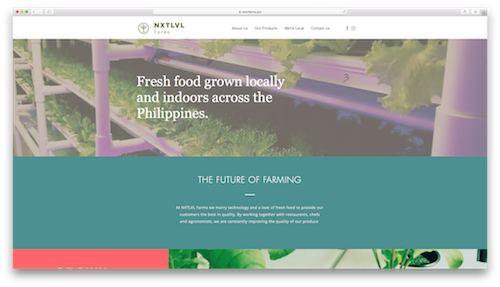 NxtLvlFarms.xyz is designed to improve the quality and accessibility of produce in the Philippines, which they are doing with their organic and non-GMO products that are grown indoors away from pests, meaning no pesticides. These vegetables can be delivered within 24 hours, ensuring freshness, and are also grown with little impact on the environment. NxtLvlFarms.xyz, NxtLvlWater.xyz, and NxtLvlAcademy.xyz are inspiring projects not simply because of the huge scope of the problems they’ve chosen to take on, but also because the positive changes they’re creating will benefit many generations to come. Dreaming big and think globally are hallmark qualities of #GenXYZ, and these three .xyz sites stands as a great example for internet users around the world to follow. « Previous Post CultivateMe.xyz: Get your entire business team organized and motivated with this week’s #WebsiteWednesday!